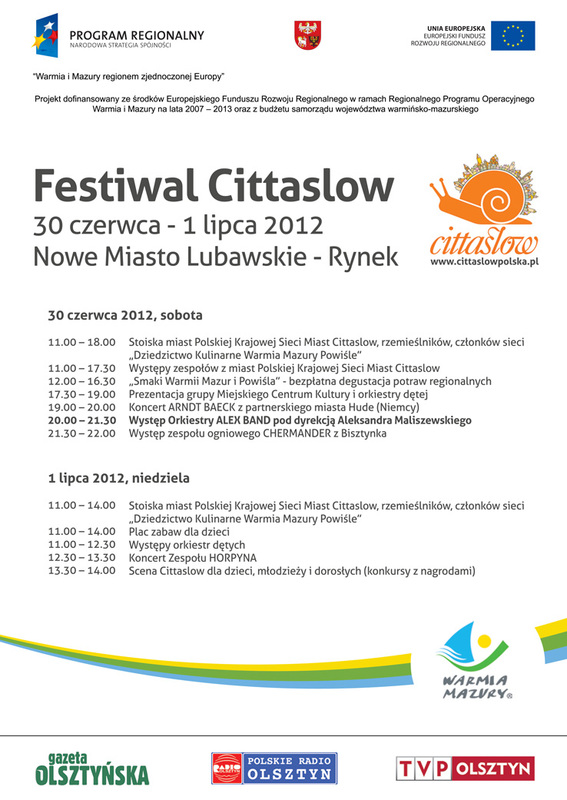 30th of June – 1st of July Nowe Miasto Lubawskie will be a host to the Cittaslow Festival! The aim of the Festival is promotion of member towns of the Cittaslow International Association, their craft and cultural and artistic heritage. On the Marketplace in Nowe Miasto Lubawskie you will be able to meet artisans, musical, theater and circus artistes and representatives from Polish Cittaslow towns. They will be accompanied by the fair of natural and traditional food. On Saturday, 30th two restaurant members of the Culinary Heritage Network Warmia Mazury Powiśle (www.culinary-heritage.com) will present their offer in form of free degustation of regional dishes. The import ant part of the Festival is the conference planned for Saturday, 30th under the title 'Cittaslow – a Network of Towns Promoting a Good Quality of Life'. It will be moderated by Prof. Krzysztof Skalski form the Institute of Public Affairs from Jagiellonian University, member of the Cittaslow International Scientific Committee. Foreign guests, representatives of national Cittaslow networks from Denmark, Great Britain and Turkey will participate in it. The programme of the Festival is enriched by parallel festivities of Days of Nowe Miasto Lubawskie. Member towns of the Polish National Cittaslow Network are – from Warmia and Mazury Region : Biskupiec, Biszynek, Nowe Miasto Lubawskie, Lidzbark Warmiński and Reszel and Murowana Goślina from Great Poland Region. The guest of the Festival will be as well the towns from the Warmia and Mazury Region pretending to become a Ciitaslow member : Gołdap, Olsztynek and Ryn. The procedure of their adhesion is open.